I have over 35 factory GM sets of power door locks for 70-76 GM cars. Chevelle Olds Cutlass Nova Camaro Firebird Monte Carlo Lemans GTO Skylark GS Impala Cadillac Caprice and more. I can refurb a set to like new for you OR sell them as-is. 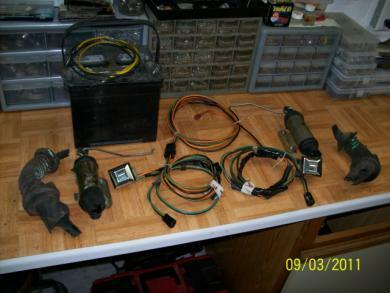 Each set includes: two solenoids, two switches, complete wiring harness, and linkage rods. If you need a pair of rubber door jamb boots they are available at an additional cost of $30 per pair. All sets are tested and working great as-is. Shipping is $15 USPS priority mail. ***Again--- I have ALL OF the different types of solenoids (only the brackets change from car to car) so please email me your car's make and model and year so I know what to set up for you. *** I can also repair your current set of power door locks to save you some money if you prefer that instead.